“Cut Them Short Please”- This is a common request from my patients on cutting their toenail short for all the wrong reasons. This often offers an opportunity for me to educate my patients on why this request is not such a good idea for them, and I wanted to share it with you all, so that the community would better understand how to prevent more painful, nail problems. First, we must understand that there is an integral relationship between the nail plate, the nail bed and the flaps of skin on either side, known as the sulci. We must also appreciate the function of having nails, which is protection and sensation. Both of these functions are compromised when the nail is cut short. Also, when the nail plate is cut short, the sides of the leading edges of the nail can and often do create problems against the soft sulci skin, especially if you are wearing shoes that are often tighter in the forefoot. Toes that are deformed and squashed together or over crowded, will also create pressure from the sides of adjacent toes and create painful problems. In addition, when the nail plate is cut short, the nail plate is often caused to involute, which means it has more tendencies to curve into the sulci, pinching the nail bed, and sometimes, scooping the nail bed in-between the curled nail. 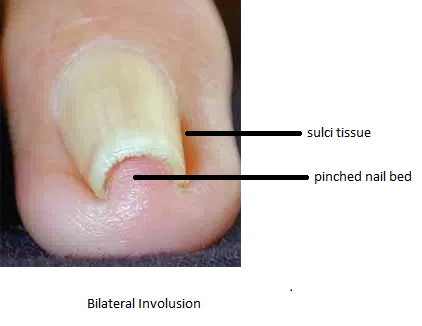 The sulci tissue also has the effect of forcing down the side edge of the nail, further increasing the curling. The end result is irreversible, painful and often ongoing irritation. It limits wearing certain shoes, and even tight hose is uncomfortable. I have also had patients report that the bed sheets also cause pain and discomfort. It can also limit activity such as simple walking. Treatment is not always easy as involuted nail requires skill and patience, as it is often painful. The nail edge is required to be separated from the very close proximity of the nail bed and the sulci tissue. This requires special instruments, patience and lots of education. Often, the patients opt to have the nail cut short to avoid the pain as it grows, not understanding that the problems is further perpetuated. An involuted nail is often mistaken as an ingrown toenail, but it is not. Treatment attempted by inexperienced people (such as self or a family member, pedicurists, aesthetician, foot care nurses and even family doctors) can and often do more harm than good. When treated incorrectly, involuted nails has led to full blown ingrown nails, which are far more severe and very painful with a full complement of inflammatory signs. When the situation is too severe and ongoing treatments are too painful, the option to surgically remove the offending nail is considered under local anesthesia. However, not all patients qualify due to compromising medications and health issues. I hope this serves you well to better understand the nature of involuted nails. Regulated specialists, such as a Chiropodist, will give you the right advice, examination and treatment when it comes to preventing such discomforts and promoting healthy, happy feet! 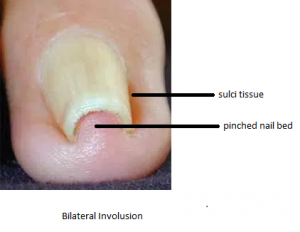 Interesting article on involuted nails!